Bill and Patrick have gone to play in the neighborhood Turkey Bowl. I am trailing along in a while to do my part in the game. However, Bill is smoking the turkey this year and I have explicit instructions what to do in the next 45 minutes: turn 90 degrees, add two briquettes, etc. I have never smoked a turkey so I hope I don’t mess it up. Tune in at another time to find out how the bird fared. The brine, which included four Jalapeno peppers, was really a tasty concoction. And why do I have time to blog when I have 10 people coming for dinner? That is a subject of another blog. For now, off to turn the bird and return the punt. 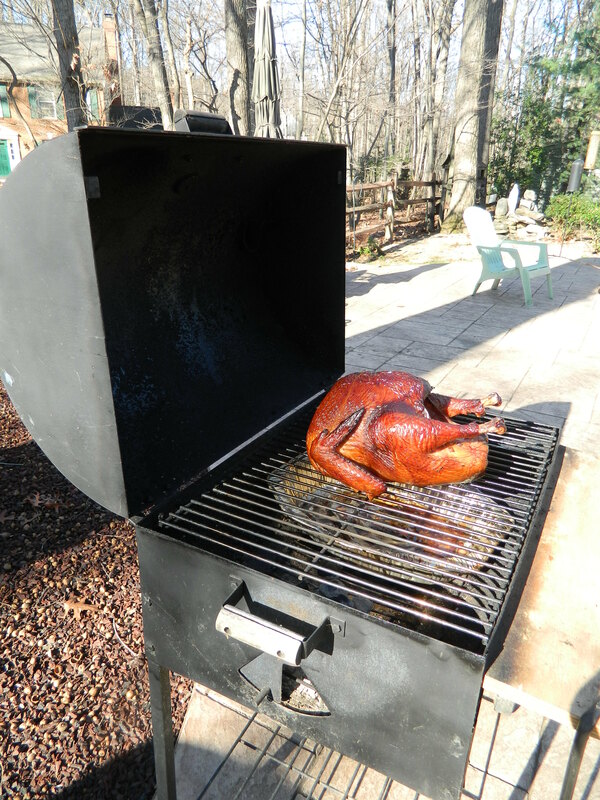 This entry was posted in Christmas, Cooking, Family, Food, Holiday, Hospitality, Thanksgiving, Uncategorized and tagged how to smoke a turkey, Nikon CoolpixL120, smoked Thanksgiving turkey, Smoked turkey, Thanksgiving by Barbara Garneau Kelley. Bookmark the permalink.